Thinking about limestone cleaning honing polishing sealing seems a lot do do on a limestone floor. But polished limestone floors can be difficult to keep clean and retain the shine. Over time the surface starts to wear, loose its polish and get grimy. So the tiles will need work to restore the original finish. I bet you didn’t realise that cleaning can contribute to the loss of shine. Unfortunately, standard floor cleaning chemicals are not made for cleaning natural stone like limestone. These chemicals contain ingredients that damage limestone. The floor doesn’t just get attacked from cleaning chemicals. Many chemicals in your kitchen and bathroom are acidic. Acidic chemicals like vinegar, lemon juice and most liquid hand soaps will dissolve limestone, leaving ugly etch marks. As well as suffering from chemical damage, limestone also suffers from mechanical damage. Most limestones are relatively soft stone compared to hard stones like granite. This means that grit from foot traffic will scuff and scratch the surface of the stone. We have found that many people don’t really understand how to polish limestone floors or other stone floors like; marble, granite and travertine. 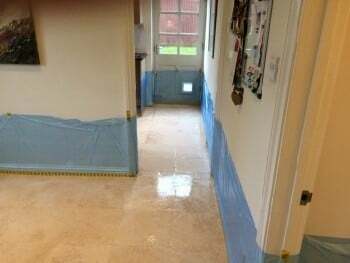 So don’t be too dismayed if your limestone floor has gradually gone dull and you can’t the original shine back. help you understand what’s involved in cleaning and polishing limestone. 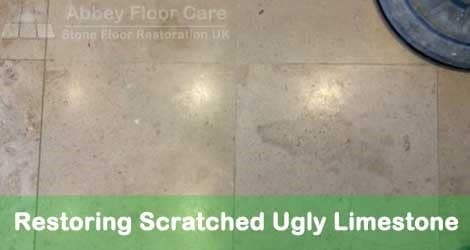 show you how easy it is to keep your limestone floor looking beautiful for longer. Limestone Polishing we recently completed in Kings Lynn Norfolk. This job has an interesting twist because we arrived at the job expecting to restore a Travertine tile floor. 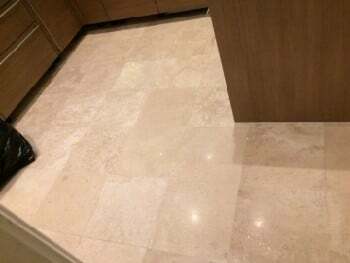 The client bought the tiles from the supplier as Travertine, and I must admit that the floor can be mistaken for travertine by the unexperienced eye. This was because the tiles in the photographs had filler in them making them look like filled and honed travertine. Once I arrived it was obvious to me that the floor was Limestone. Only a few of the tiles had areas of filler and these were the tiles that the client had photographed. The majority of the tiles were solid without any filler. The tiles were worn and dull, however, the floor had the beautiful, velvet finish that is a feature of limestone. Some of the tiles had filled holes, and these were the tiles that the client had photographed. I was surprised that the supplier sold the tiles as Travertine, but it just goes to show how easy it is to make a mistake when dealing with stone. 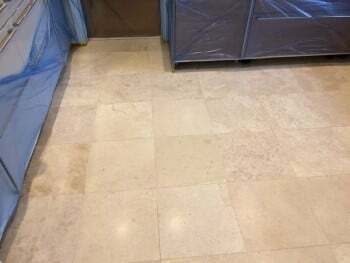 With the change from Travertine to Limestone, I had to change the work schedule, because cleaning as cleaning honing polishing sealing a Limestone floor is a different process to restoring a filled, honed Travertine floor. Limestone is a dense, sedimentary rock, which means it was formed from the bones and shells of ocean-dwelling organisms. As these organisms die, their shells and bones settle on the ocean floor where they are compacted over millions of years, creating limestone from the sediments and the pressure of the ocean water. Limestone floors can be resurfaced by grinding, honing and polishing. Machine grinding and honing can remove the deepest scratches and marks, leaving a beautiful new finish on the floor. The floor can then be polished to a variety of finishes from dull smooth, through light sheen to a polish. Travertine is a natural stone like Limestone. However, it is not the same as Limestone because it is formed in a different way. Travertine is formed when water that has percolated through rock containing limestone, other minerals and organic matter. The dissolved limestone along with the other minerals and organic matter form into layers of stone. Over time, gases escape creating holes, giving the stone a honeycomb or sponge-like structure. Filled, honed travertine is made by filling the holes in travertine with polyester fillers. The stone is then lightly abraded to smooth the filler and the stone, creating a highly attractive, light sheen finish. I don’t recommend grinding or aggressively honing filled travertine because the process removes the fillers and reveals more holes in the stone, making restoration a costly process. I normally restore filled travertine by lightly honing and polishing the surface, so no new holes appear. However, this process does not remove heavy scratches, so the finish is not as deep and clear as when we restore marble or limestone. I explained the options now available because the floor was Limestone. We agreed on a polished finish. We started, as always, by protecting the walls and adjoining floor from slurry splashes. We always ask that doors are removed from the work area to give free access to all the floor, for our equipment. 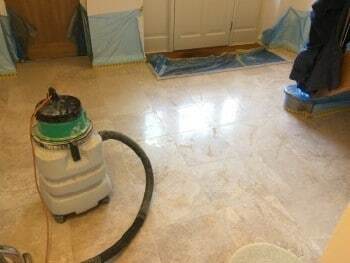 Limestone cleaning and restoration work is dependant on the condition of a floor and the amount of lippage. The lippage – difference in height between adjoining tiles, was generally below 1mm, which is very good, and quite unusual. The floor was generally in good shape. There were no deep scratches. These scratches are usually the result of dragging furniture across a floor. There were lots of small scratches consistent with foot traffic. As the floor was not badly scratched and had minimal lippage, we did not need to grind the floor to achieve a high-quality finish. 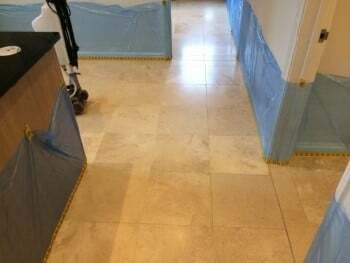 So we started the limestone cleaning honing polishing sealing work by honing the floor with aggressive 100 grit diamond tooling. The image below shows how the 100 grit honing removes the surface of the floor, removing all the surface scratches. This process took most of the rest of the first day. We finished off by cleaning areas of dirty grout around the cooker and the sink using a rotary scrubbing machine and 800 grit honing powder. On the second day, we honed the floor with 200 grit, 400 grit and 800 grit diamonds, giving a lovely smooth light sheen finish. We then honed an area of the floor to a 1,500 polished finish, so that our client could choose her preferred finish. After some deliberation, she decided on the 1,500 grit finish, finished off with limestone polishing powder. The floor could have been finished to a higher shine using a 3000-grit diamond pad, however, this finish will start to show scratches and scuff marks in high traffic areas around the kitchen. Once the floor was rinsed and dried, we applied a high-quality impregnating sealer. Our client was delighted with the finish on her floor. The limestone now has a silky gloss finish. Mopping is so much easier because the mop glides over the smooth finish. Before leaving we gave clear guidance on maintaining the limestone, the correct limestone cleaners to use and the right microfiber mopping schedule, so the floor will stay cleaner for longer.